Thunder Moo #1 – Pg. 37 – DairyBoy Comics! And we have now reached the conclusion of the Thunder Moo story arc. Special thanks for reader Grayson Starr for providing the reaction images in the last two panels. Before I go into my End of Story Arc recap, I’d like to take a moment to tell you guys about Sgt. Stubby. 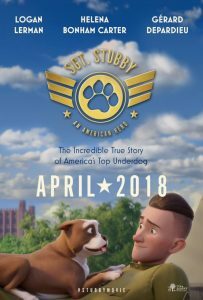 It’s this fantastic animated movie based on a true story about a worker dog that served in WW1. As an animation lover, history lover, and (most importantly) dog lover, I immensely enjoyed the film. The reason I am bringing it up here is because unfortunately the movie isn’t doing very well. Despite a decently positive reaction from critics and fans who have watched, the movie didn’t have much in way of marketing behind it and is basically relying on word of mouth. As a result, its hanging by a thread. Please go support this film. It makes me sad that it’s not getting the recognition it deserves. The animation market is watered down with garbage like MINIONS so I liked having something with a little more heart put into it. It breaks my heart that it’s theater life may be so short. As well, a portion of ticket proceeds go towards helping rescue dogs find homes. SO FIND A THEATER PLAYING THE MOVIE AND GO ENJOY YOURSELF WHILE HELPING THE DOGGOS DAMN IT. Okay, now that that’s out of the way, here’s my thoughts on the story arc! So despite not even being my longest story arc, at one comic a week this was easily my longest running. I think I started this thing back in late July the week after San Diego Comic Con. I feel like having the vote kept the wait between comics from being as bad, which is why I decided to go with this story arc right now as I’m stuck in a point in which I am unable to produce more quality comics. One might ask how much of this story arc was planned out. The answer is… not a whole lot. Kidd was always destined to end up becoming Thunder Moo, even prior to her introduction in the first FFA story arc a few years ago. The first few times I tried writing up a Thunder Moo themed issue, it just wouldn’t feel right and I’d scrap the idea for the time being. When I had the idea of letting you guys direct the story with your votes, I was a bit more inspired. I decided on a basic villain in the rats as Thunder Moos first adversary. I then came up with a reason Thunder Moo would be facing the rats, which was Derrick going missing. And then I plotted out the story path as far as Tony and Austin capturing Thunder Moo (regardless of what path was taken at the beginning of the story, the sub-plot with Tony trying to take her powers away was always going to happen). I decided from there it was time for all the previous votes to begin effecting the story. Deciding to go back to Tony’s lab instead of breaking out of the shield meant that Thunder Moo wouldn’t reach Ratfink in time to stop him from turning Derrick into a rat. Deciding to go get Fast Food meant Thunder Moo and Austin didn’t reach Ratfink in time to halt his attack. And of course, the story’s true villain ended up being one created by Thunder Moo herself through the decision to leave Rey in his cell or let him out. For a while I was contemplating creating a story track you guys could read through that would show you every other possibility. I decided however to keep those possibilities secret for now. They could still be useful in later story arcs! So let me know what you guys thought of this whole thing and if there’s anything you’d want me to do different next time. As far as what’s next, the answer is… I don’t know. I have a story arc written up to its ending, and it still needs some tweaking. If you’d rather see me keep the story going forward despite the once a week schedule, I can get that ready to go. Though I may try doing some video game comics for a bit.